SIDE A WORLDWIDE - New Album Out! That is exactly what SIDE A did on its seventh and latest album entitled "ANG ATING AWITIN" (Our Songs). Arranged and produced by band members Joey Benin and Naldy Gonzalez is a collection of some of the best and most memorable OPM compositions of recent years, revived and re-arranged for better appreciation of today's audience. 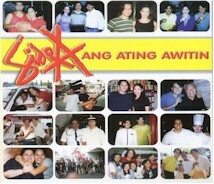 The Carrier single of the album is "Ang Aking Awitin", originally popularized by Bong Gabriel and composed by Egay Guerrero and Randy Ray. Also included are revivals of other OPM hits like Anak, Let the Pain Remain, Kailangan Kita (done acapella, with Ryan Cayabyab as vocal arranger, Pinay, Habang May Buhay and Manila. The band also does it's own rendition of a Filipino Classic, Ugoy ng Duyan ,a Lucio San Pedro composition.